Net profit after tax at Australia-listed slot machine maker Aristocrat Leisure Ltd rose 2.8 percent in its fiscal first half, on revenue that rose 28.5 percent, said the firm on Thursday in a filing to the Australian Securities Exchange. Such profit for the six months to March 31 was AUD256.5 million (US$193.8 million). Revenue for the period was nearly AUD1.58 billion, compared to approximately AUD1.23 billion a year earlier. Costs associated with generating revenue rose 37.4 percent, to AUD669.5 million, compared to AUD487.4 million in the prior-year period. The company also reported higher design and development costs, as well as higher spending in sales and marketing. The latest reporting period incurred acquisition-related costs – on a cash and non-cash basis – amounting to AUD97.6 million. They included “transaction costs, retention payments and other related costs,” said the firm. During the period Aristocrat acquired digital content provider Plarium and social casino business Big Fish. The firm’s directors authorised an interim fully-franked dividend of AUD0.19 per share, to an aggregate of AUD121.3 million, in respect to the six months to March 31. The record and payment dates for the interim dividend are May 30 and July 3, respectively. 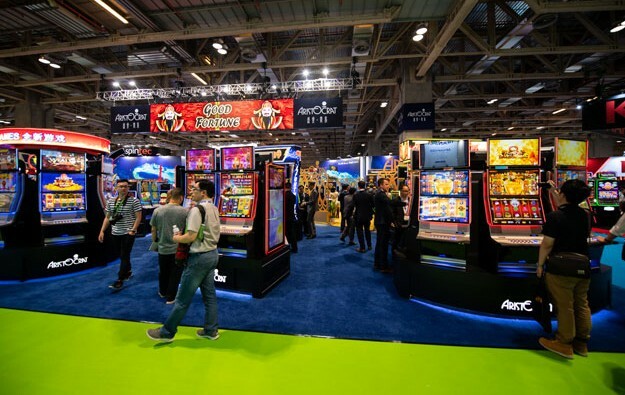 In International Class III products, including slot machines for the Asia-Pacific region but excluding North America, revenue judged in constant currency but on a normalised basis decreased 16.3 percent year-on-year to AUD108.2 million – from AUD129.2 million. The firm said that was due to “the concentration of [venue] openings in this segment in the prior corresponding period”. Segmental profit for International Class III on a normalised basis fell 22.6 percent year-on-year, to AUD55.2 million, from AUD71.3 million. Aristocrat Leisure said that group-wide on a normalised basis – taking account of profit before amortisation of acquired intangibles – its profit was AUD361.5 million, representing growth of 32 percent in “reported” terms, i.e., without adjustment for currency exchange rate fluctuations. The firm earns much of its money in U.S. dollars, supplying machines to the North America market. In local currency terms, Americas profits for the casino segment increased by 18 percent year-on-year to US$319 million, on revenue that rose 10.5 percent, to US$592.8 million. The firm said the Americas performance showed 3.3 percentage points of margin expansion year-on-year. The group said that in the digital segment, profit rose 165 percent year-on-year, to US$150 million, on revenue up 230.6 percent, at US$428.5 million. But it added: “Margin moderated in line with expectations as the digital business scales to include a new social gaming segment.” Such margin fell 8.7 percentage points, to 35 percent, from 43.7 percent. Aristocrat Leisure confirmed in Thursday’s filing that it expects “double-digit growth in normalised profit after tax and before amortisation to continue over the twelve months to 30 September 2018, compared to the 2017 full-year result”.